Empowered by the Great Luang Phu Kam Saen of Wat Don Moon, with Special Second Blessing from the Arahant Monk Luang Por Kasem Khemago, released at Wat Udom Tamm Rangsi Temple, in Chiang Mai. Luang Phu Kam Saen Kunalangaro of Wat Don Moon in Chiang Mai, performed empowerment for a full Traimas (Trimester) throughout the rainy retreat of the year of 2516 BE. After he had completed his empowerment rituals. He then travelled to see the great Arahant Luang Por Kasem Khemago at the Sussan Trailaks in Lampang, to beseech him to offer his Blessings and Further Empowerment over the amulets. Luang Por Kasem conceded and gave these most attractive sacred powder images of Somdej Pra Puttajarn (Dto) Prohmrangsri another full Traimas Blessing, spending a full 3 months of nightly empowerments during meditation in his Kuti. The front face of the amulet features the image of Somdej Pra Puttajarn (Dto) Prohmrangsri in his famous posture holding the rosary, sat in Samadhi Bhavana, inside a bell shaped arch, with a Vajra belltop, which of course represents Wat Rakang Kositaram ('Wat Rakang' meaning 'Temple of the Bell'). The words 'Somdej Pra Puttajarn (Dto) Prohmrangsri' are embossed on the base of the arch. The amulet has developed 'Kraap' stains, which come from Holy Prayer Water sprayed over the amulets during blessings. Small cracks have begin to form, which is a part of the climatic changes due to humidity, and which over time, recede to congeal and condense, and will eventually become very tightly compressed to form a crackled surface, as is often seen in many examples of the famous Pra Somdej Wat Rakang Kositaram, adding to the beauty and character of the amulet. Some exhibits may have Kraap Stains, and others may not, depending on each amulet. It is a matter of personal taste, as to whether one prefers the exhibit to have Kraap Stains, or not, depending on the personal preferences of each collector or devotee. 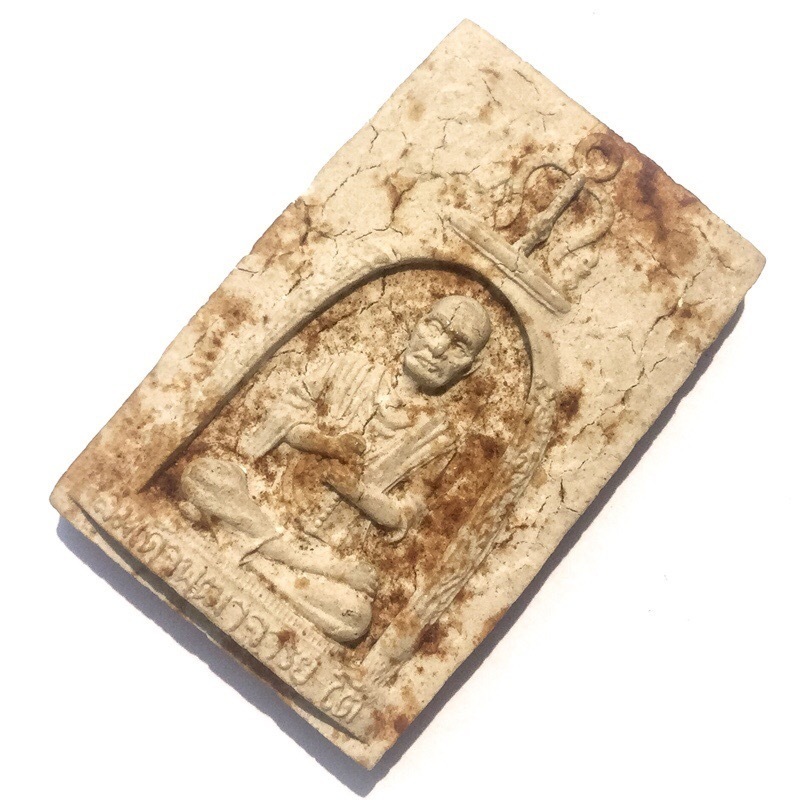 The rear face of the amulet has the Sacred Yant Pra Putta Jao Sip Ha Pra Ongk 16 Buddha Yantra, which contains the Kata of the turning of the 4 elements containing the invocation of the 16 Buddhas. 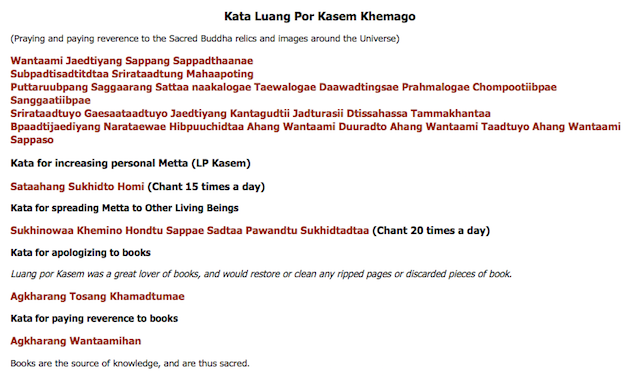 It is said that whoever chants this Kata regularly and possesses the 16 Buddha Yantra will never fall into Hell Worlds or the worlds of the Hungry Ghosts. 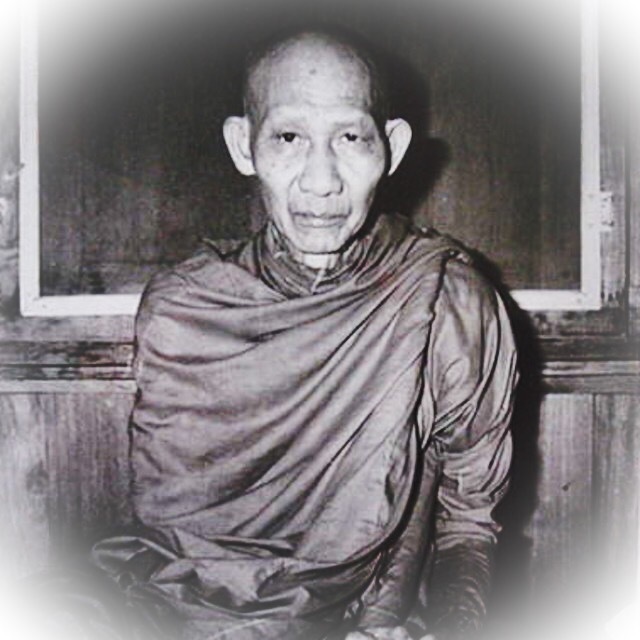 Kroo Ba Kam Saen of Wat Don Moon, was a top Gaeji Ajarn Guru Monk of the Lanna Tradition, famed for his Wicha Wua Tanu Sacred Arrow Bull. He was a direct student of the Great Arahant Monk Luang Phu Mun Puratto, and cose friend and colleague of Luang Phu Hwaen Succino, of Wat Doi Mae Bpang. Luang Phu was born in 2436, and passed away in 2522 BE, and is considered an Arya Sangha Guru Monk of highest reverence in the Lanna Tradition. 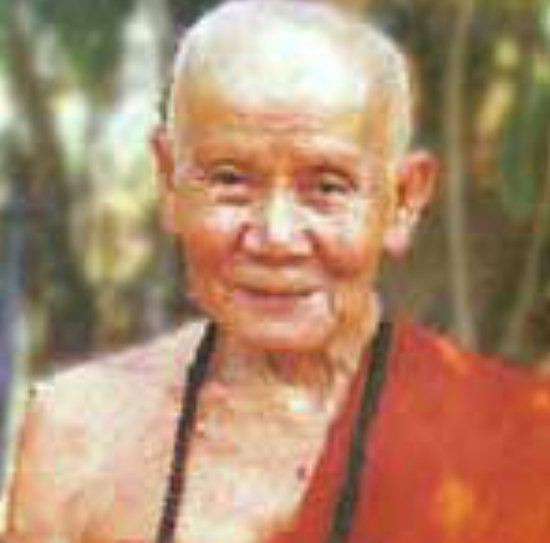 Luang Por Kasem Khemago of the Samnak Sussaan Dtrailaks, in Lampang, is considered an Arahant in Thailand. His Birth was predicted by the Great Kroo Ba Srivichai naming him as the ‘Meritorious One’, and his Legend is One of Great renunciation and Purity. Luang Por Kasem was inimitable for the fact that he was Abbot of a large temple, and one day disappeared, to be found on the edge of the forest in a Sala resting place, where the devotees had sought him out worrying where he had disappeared to. They beseeched him for hours until they finally had to give up when it became evident that Luang Por kasem did not wish to be caught up with the worldly duties of a large temple, and had decided to flee to the forest to practice and follow in the footsteps of the Lord Buddha. He remained in the forest in a deep zone of the Jungle where people found it almost impossible to remain, due to the massed of insects and mosquitos. 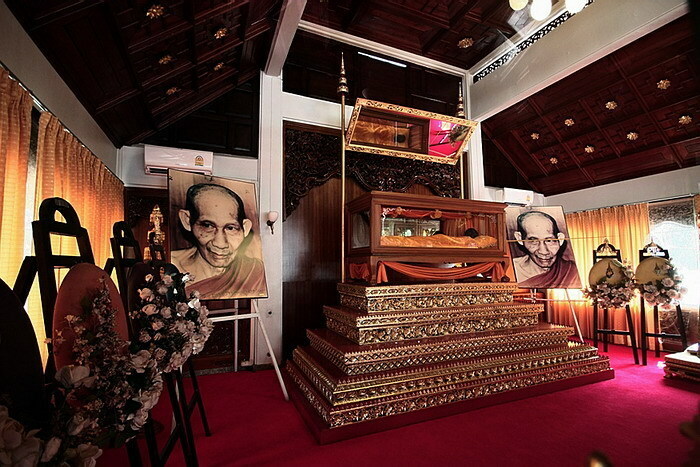 But Luang Por Kasem was able to remain without being bothered, despite wearing only a sparse yellow Civara robe. It is said that he practiced the true Tudong Methods of keeping only one robe, and not bathing for a period of 3 weeks at a time, but that his body would not smell, and indeed had a perfumed odor to it. The mountainside forest area where he remained finally became a Samnak Songk and eventually a temple, where the remains of the Arahant are kept to this day in a glass coffin, for Devotees to pray to and be inspired by his great Patipatā.